1 . No Book shall be taken out of the library without the knowledge of thelibrarian and until it has been properly entered in to the issue Registersand the entry attested by the borrower. 2. The borrower must examine the condition of the book before it isissued; otherwise in case of damage discovered later presumption will be against the borrower and he may be called upon to replace it. 3. Books will be returned within the period allowed to a borrower. 4. When the date for return of books falls on a holiday it may be returnedto the library on the day it reopens. 5. All the borrowers shall return the books to the library before the Collegeis closed for long vacation. 6. Anybody in possession of a library book shall return to the library onreceipt of a requisition notice for the book from the Librarian. 7. Book taken of the library in the daily issue, must be returned to thelibrarian on same day, within 3.00 P.M.
8. No marginal notes or markings shall be made in the books nor shallany picture of pages be removed or torn or otherwise disfigured. In extreme cases the borrower shall be asked to replace the book damaged by him. 9. The librarian will report to the Principal the names of the person responsible for improper use of the library books. 10. Although ordinarily there will be no restriction on the use of library Books, the Principal has the right to recommend for books to intending borrowers under extra ordinary circumstances. 11. A borrower against whom any overdue or other charge is outstanding shall not be allowed to borrow books from the library and borrowers will be allowed to withdraw his library caution money unless his library dues are cleared. 12. If any borrower keeps a library book in his or her possession for more than the time allowed for the purpose, no more books will be issued to him or her until the book concerned is returned to the library. 13. All those who may happen to be inside the library are expected to observe strict silence.
' 14. The Librarian has power to see that the rule of silence is strictly observed and to report any wilful breach of the rule. 15. Members of the teaching staff are also expected to use their influence to promote the observance of these rules whenever they are in the library and to report to the Principal in cases of deliberate disobedience and misbehaviour. 16. The following is the list showing the maximum number of the books that may be issued to various classes of borrowers and the maximum time allowed to retain the books with them. 17. A book issued to a borrower, may be re-issued to him only when there is no other claimant for it. 18. In the beginning of the session each student (+2 1 st. Year & +3 P-l) will be provided with a Library Card for record of borrowing and return of books by him and for the rest of the students the library card will be renewed after production of renewed Identity cards. 19. Any book lost or defaced by a borrower must be replaced by him/her. If replacement is not possible he/she will have to pay four times of the cost of the books. 20. For general transaction the library counter remains open from 10.00 A.M. to 1.30 P.M.
21. Honours students will be issued Honours books only from their respective departmental seminar Library by the concerned Prof. Incharge of Seminar. 22. At the time of transfer of officer in charge of seminar library, one who takes over the charge of the seminar later on has to take simultaneous charge of books in the Dept. Seminar Library & also from the General library. Concerned H.O.Ds are requested to inform the Librarian. the name of new officer in charge. 23. Prof. I/C of Examination is to send the Admit Cards of all Honours students of University Examinations to the respective H.O.D./ Officer I/C of Seminar Library for distribution among the honours students,which will help in collecting seminar books from the students. 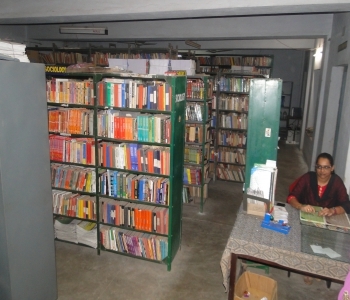 provided a separate reading room inside library. 2. Every student is required to show the Identity Card at the entrance of the library reading room. 3. Students are not allowed to enter into the library stock room in any case. 4. All categories of borrowers are advised to maintain complete silence inside the reading room. Any deviation of this rule will be severely dealt with. 5. For use in the Reading room, one journal or a newspaper at a time may be Issued to every student on production of Library card. No student in allowed to take the journal or newspaper outside the reading room. All such must be returned latest by 3.00 PM on the same day otherwise fines will be imposed per day at the rate of Rs. 5/- for syllabus & questions Rs. 2.00 for newspapers and Re. 1/- magazine and journal for not returning on the same day. 6. Photo copy facility is available in the Central Library with a nominal charge of 0.50 paise per page for all users. 1 . The Student borrowers are subject to obey all the rules in Section-II. 2. In case of these students who do not return the library Books within the time allowed, a fine of 1/- per head per book will be charged for each day's delay. In such cases a student has to obtain a chargeslip towards the amount of fines to be collected from the librarian and deposit the fines at the College Cash Counter and produce the money Receipt along with the books at the library counter for the return of the same. 3. Any student who wants to take books from the library should present the library card to the Librarian. He should also present the library card to the Librarian whenever he wants to return a book. 4. Ordinarily no student will be allowed to keep a library book with him / her during the Summer Vacation. 5. If a student loses his Library Card or tears or defaces it issued to him,the loss of the Library Card should be informed to the Librarian immediately on application with the payment of 10/-. 7. It is more important that the Library Card should always be used by the person concerned. In no case it should be handed over to any body else for use. If it so happens the matter will be seriously dealt with. 8. Smoking, sleeping, spitting, gossiping and mobile phones are strictly prohibited in the Library. 9. Books will be issued to +3 students on Monday, Tuesday and Wednesday and to +2 students on Thursday and Friday. 1. There is a reading room for the students which is open from 10.00 A.M. to 3.00 P.M. on all working days Members of the staff are provided a separate reading room inside library. SECTION - III (ADDITIONAL RULES FOR STUDENTS) 1 . The Student borrowers are subject to obey all the rules in Section-II.